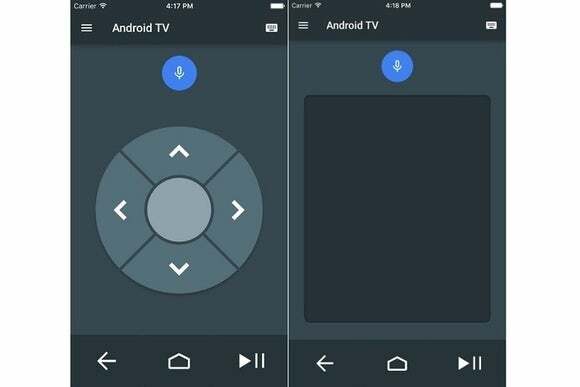 Google has released an Android TV remote app for iPhone and iPad, but don’t expect much from it. Like the existing remote app for Android phones and tablets, the iOS version lets you tap on a virtual D-pad, swipe on a virtual touchpad, play/pause, hit the back button, hit the home screen, and conjure voice search. It also includes a keyboard for faster on-screen typing. No, it’s not a particularly imaginative app, but in fairness, hardly any of the phone control apps for modern media players are. Apple TV? Virtual remote buttons on a touchscreen. Amazon Fire TV? Virtual remote buttons on a touchscreen. Roku fares better, letting you browse channels and new arrivals in Roku Feed, and listen privately through headphones using the new Roku Streaming Stick. But it’s still virtual remote buttons on a touchscreen when you want to actually control the device. Google actually has a solution to this problem with Google Cast, the second-screen control system that’s built into Chromecast and Android TV. Instead of tapping virtual remote buttons on a touchscreen, you open an app like Netflix or Hulu on your phone, hit the Cast button, then use the app to browse and select a video. Once you’ve made a selection, it automatically starts playing back on the television. As a way to control your TV from the phone, it’s genius. But while Google Cast works fine for streaming video apps, there are large swaths of the Android TV interface where you’re back to tapping virtual remote buttons on a touchscreen. Why not include a small-screen interface for the Live Channels app, or shortcuts to the Recommendations bar? This would take a lot more effort, and it’s becoming increasingly obvious that Google’s emphasis is behind Chromecast and Cast-enabled TVs. So, virtual remote buttons on a touchscreen it is.